Fair Isle Bird Observatory: the Warden's diary: Here We Go! Fire up the walking boots, sharpen the biros and gird your binoculars my friends, for the 2015 season starts here. After a largely wet and windy winter that delivered very little in the way of avian surprises, we've had a couple of spring like days recently, with SE winds and migrants coming in. The 26th coincided with my return from holiday (a very pleasant week and a bit of birding in Nepal with my Dad - good weather, great birds, fantastic wildlife and a lovely chance to spend some time father/son time that wasn't just trying to get the Transit fixed or replace a door) and the first full-team census of the year. A good arrival of birds was evident, especially on the more sheltered north and west cliffs, with counts including 56 Goldcrest and 76 Blackbirds, along with smaller numbers of other common migrants. Today has started with bright weather, although there is likely to be rain soon and it looks like we'll get Saturday off as heavy rain is forecast for the day, but it's maybe good to ease ourselves into things slowly! A Greater One-horned Rhinoceros, not trapped yesterday. 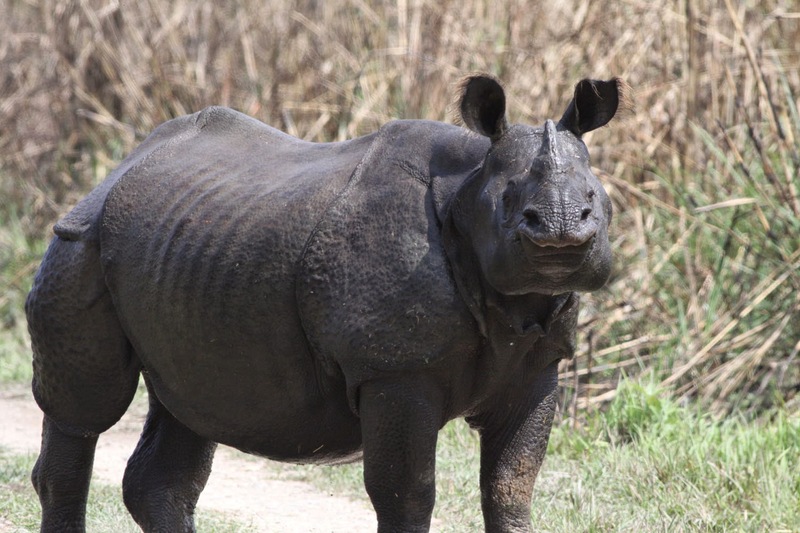 This one was at Chitwan and was one of many wonderful animals we saw, although we just missed out on seeing Tiger (we were on a watchtower just round the bend in the river from where a large Tiger crossed just out of sight from us). Grace decided to make up for it though by making herself up as a Tiger and hiding in the garden when I got back (whilst Freyja joined in as a Leopard, although we did see one of those!). As a consequence, Grace has gone to school this morning looking like she's wearing fake tan. At some point I'll have to sort through the hundreds of photos to put together a talk about the Nepal trip. Whilst I was away, Ciaran and Chris returned to the island and between them (and Susannah), have racked up a few impressive sightings, including a peak count of 7 Stonechat (the highest count since 2010) on 17th, along with other typical early migrants including Chiffchaff, Moorhen, Grey Wagtail, Black Redstart etc. You'll find all of March's sightings on the Latest Sightings page of our website. A Moorhen was seen in Gilsetter before being trapped the following day (photo: Ciaran Hatsell). If you have any thoughts on what we might be going to get (or just fancy having a guess for a bit of fun), then be sure to take part in our easy to enter Prediction Competition, although you'll have to be quick as enteries must be received by first light on 1st April to be in with a chance of winning the prize. Also coming up soon is the deadline for the last couple of roles available at FIBO this year, including an Assistant Warden job. Click on this link for details.